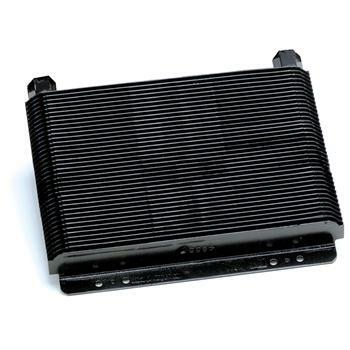 B&M SuperCoolers are 100% aluminum construction and use stamped plates sandwiched together to create one of the most efficient oil cooling devices available. Not only does this unique design provide for maximized cooling through more efficient heat dissipation but it also provides a much sturdier cooler which is practically impervious to flying rocks or other debris. Suitable for all fluid cooling needs including: automatic transmission fluid, engine oil, differential fluid, power steering and turbocharger oil in circle track, road racing, off-road, tractor pulling and monster truck applications.